The Evan + Mark Team has over 64 years of combined experience to serve the needs of buyers, sellers, and developers from end to end. With their client-centered approach to real estate, this dynamic team blends high touch with high tech at Compass. They leverage Compass’ technology platform to integrate listings, client, and transaction data all in one place, allowing them to make personalized recommendations and gain insights on how to better negotiate and serve their clients. The Evan + Mark Team specializes in new development and condo conversion, luxury property, and new construction. Leveraging their wide variety of skills and specializations, they are well equipped to provide a top-notch client experience, no matter the property. 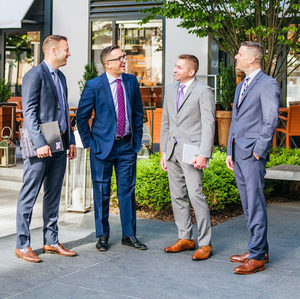 Licensed in DC, Maryland, and Virginia, The Evan + Mark Team takes pride in making the buying and selling experience a gratifying one, whether it is a historic row house, luxury condominium, or gated estate. As active participants in their community, The Evan + Mark Team has built strong relationships that go beyond business. They were voted “Best of DC 2016 & 2017” in Washingtonian, “Top Producing Real Estate Team 2017” in Wall Street Journal, and earned “Best Real Estate Team 2016” from Washington Blade.